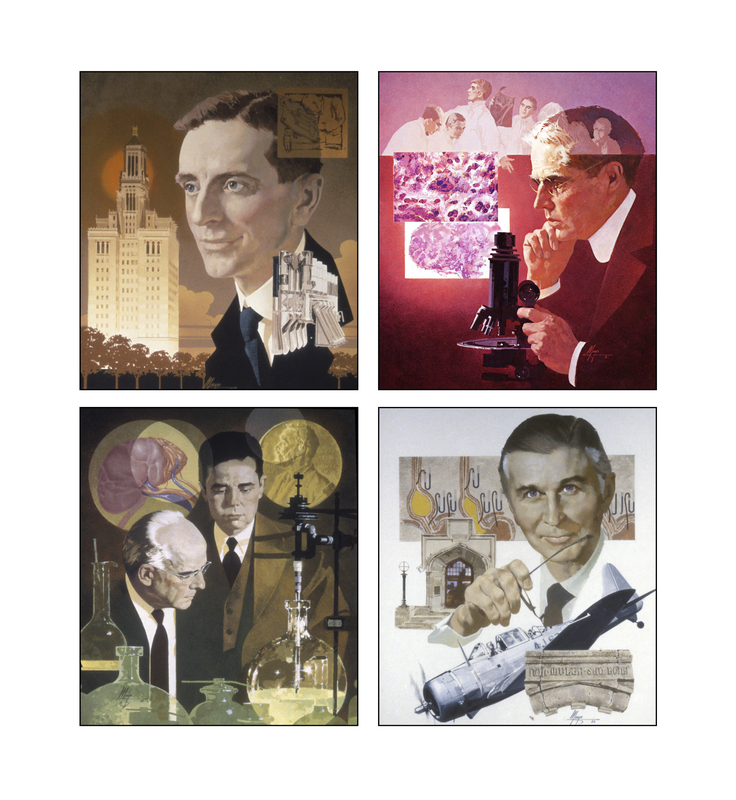 The Artist: We came across these remarkable portraits of Mayo Clinic scientists, all created by the same artist back in the early 1980s. He was not a Mayo staff artist, but a freelance illustrator named Mayo Olmstead (really). Olmstead studied at the School of Allied Arts in Chicago and worked for several ad agencies before coming to St. Paul, Minn., in 1953 to work as a calendar artist. His freelance work gained national attention, appearing in promotions for Beechcraft Aircraft, General Mills and Allis Chalmers, among others. He excelled at portraits and these are some of his best. The Scientists: They are (clockwise left to right) Henry Plummer, M.D., (without his glasses) who discovered the major cause of hyperthyroidism, invented the medical record and introduced X-rays to the Mayo practice; Louis Wilson, M.D., who launched Mayo’s laboratory sciences and it’s graduate school; Edward Kendall, Ph.D., and Philip Hench, M.D., Nobel laureates who discovered cortisone; and Charles Code, M.D., whose discoveries led to antihistamine medicines, treatments for ulcers, and one of the first G-suites so pilots in World War II wouldn’t black out. He was also Mayo’s first director of education and research.